It’s that time of year. Cool Spring months are algae months. The annoying stuff is slimy, sloppy, serves no purpose, not aesthetically pleasing, and floats around ponds where you don’t want it. The most common annoying variety is filamentous algae. Believe it or not, more than 52,000 species of algae have been identified worldwide. Some are good. Researchers have determined that algae in oceans replenishes much of the oxygen we breathe. Single cell algae, in your pond, is a good thing and the basis of Nature’s food chain. However, the angel-hair looking growth or Brillo-pad looking clumps that foul your fishing lure, aren’t a welcome sight. Most algae species prefer cool water. In cold or warm temperatures, it usually goes away. 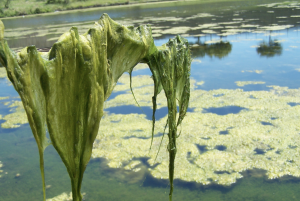 We’ve seen numerous cases where Spring algae disrupted or delayed growth of other plants. That may be a good thing, if the other plants are bad… like milfoil or hydrilla. Every plant has its individual window of growth. Three factors must be present to stimulate activity–the right temperature, sunlight, and nutrition. Eliminate one of those and the plant can’t develop. Ever see a ring of plants? That growth pattern developed because sunlight can’t penetrate the bottom beyond the deep part of the ring. Algae has several advantages this time of year. It likes cool water. Few other plants can grow now. Algae doesn’t have to get food from the pond bottom. It feeds from dissolved nitrogen in the water column, which water absorbs from the atmosphere. We see trends in ponds with algae. Most have lots of topsoil along the bottom, are near livestock, and have abundant shallow water to thrive. Remember this about algae. It is a relatively volatile plant. It won’t be there and then within hours, maybe days, it seems to completely consume an area of a pond. It can disappear just as fast…without human intervention. Other times, it comes and stays. So what to do about it? The old tried and true treatment is algaecide. Algaecide gives immediate gratification, but doesn’t solve the problem long-term. It can make a fast come-back. Some folks use pond dyes early in Spring to minimize ultraviolent rays from the sun. While this could be a good idea, try to time dye application so it will dissipate as the water warms and not disrupt natural Spring food chain production such as plankton. Other choices are barley straw and microbes. While barley straw is an organic method, it isn’t listed on any agency’s approved list, but has been used by farmers and ranches for eons. Microbes won’t kill algae. 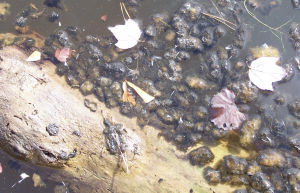 They feed on dead, decaying algae, thus effectively disrupting the lifestyle of this green junk. As colonies of bacteria feed on dead algae, the basic food source is tied-up for a while. Our hero for minimizing algae is mozambique tilapia. They provide a biological management method and love to eat algae. When stocked in proper ratios, they do a great job. Tilapia spawn every 20 to 25-days and produce abundant supplemental forage for sportfish. They don’t survive winter temperatures in our region and must be restocked annually. Check regulations in your area, they’re not legal in some states. While algae is a nuisance, it doesn’t need to be a nemesis. You can manage it…so long as you learn about it. 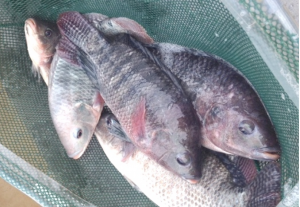 Call to inquire if tilapia are a candidate for your pond. We begin delivery in mid-April. This entry was posted on Thursday, March 28th, 2019 at 4:07 pm	and is filed under News & Updates. You can follow any responses to this entry through the RSS 2.0 feed. Responses are currently closed, but you can trackback from your own site.